Lure of the Labyrinth is another new website that presents a fresh approach to teaching math to middle school students. Math is cleverly woven throughout an underground, monster-inhabited world. Students disguise themselves as a monster avatar plunging into a shadowy factory on a rescue mission to save their missing pet. “Lure of the Labyrinth” can be played individually or in teams; an online communication device allows players to exchange ideas and game strategies and encourages collaborative game play. While the idea of driving hours with a car full of children may send shivers down the spine of even the most patient of parents, a family road trip doesn’t have to be a stressful endeavor. There are tons of games you can play with your children that will keep the “are we there yets” at bay. Best of all, they won’t cost you a thing. 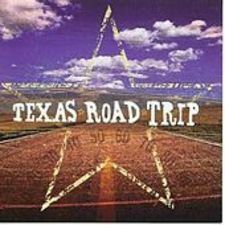 Here is a list of some road trip games and activities you can play with your children. The Grocery Game: Whether you want to challenge your memory or just whet your appetite for lunch, the grocery game is a great way to pass the time on your drive. One person starts with naming something that can be bought at the grocery store that starts with the letter ‘A’, such as “apples”. The next player would have to repeat the first person’s answer as well as add on a food that begins with the letter ‘B’. If you mess up, you’re out, and the game continues until only one memory-gifted player remains. If you get bored with groceries, try using another topic. The Geography Game: Help your kids refresh their geography lessons while on the road with the geography game. The game begins with a person naming any place in the world, London for example. The next person then has to come up with a place name that begins with the last letter of the first location. So in this case, the next place would have to start with an ‘N’, like Nepal for instance. The game continues on until someone gets stumped, and no place can be used more than once. The game can be played with any topic, so give celebrity names, movies, animals or anything else you can think of a try. License Plate Bingo: To play this game you’ll need to bring along a few writing utensils and have paper to use for game cards. If you’d like, you can print out game cards ahead of time here. There are a few variations of this game, so you can either write down the names of states as your bingo squares or random letters and numbers. As players see the states or letters and numbers on passing license plates they cross them off. First player to get 5 in a row wins, and it might be a good idea to keep a few prizes on hand for the lucky winner. Card Games: Never underestimate the power of card games to keep your kids entertained. Bring along a set of cards from home and challenge kids to play their old favorites like old maid, go fish, and rummy. If you want to find new games, check out a book on card games at your local library or print out instructions for kids games here. 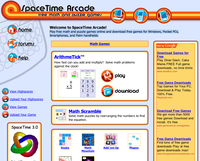 Here's a website called SpaceTime Arcade that I came across that provides free math and puzzle games. It also has games you can download (for free) for Windows, Pocket PCs, Smartphones, and Palm handhelds. Today I came across a site that allows you to play some of the classic video games from the 1980s. 2600online.com, which is dedicated to games that were played on the Atari 2600, has 50+ of these video games. This is a fun site for those of us who grew up playing Pac Man, Centipede, etc. Here's a neat (and very easy) magic trick for younger kids to perform. Not interested in shelling out $400+ for an Xbox 360 or $200 for a Playstation2? Then try the Good Experience games website loaded with links to free online games. 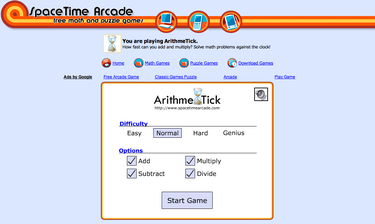 (Added 12/26/05) You can also check out this site that has its list of the top web based games of 2005.